Post-Janathon, there’s normally a bit of a hiatus on the blogging front. We all get on with our training and racing, but don’t have the pressure of having to blog our every step (never mind the jogging or logging, the blogging bit is the toughest part of any Athon). I haven’t run since the 31st, I did my usual yoga class on Wednesday night and decided to treat myself to a few rest days before seeing how my legs feel on Sunday. This gives me chance to venture down to London for the Janathon meet up (de-railed train services and weather permitting) and get a bit crafty. Since I finished my wibbly wobbly scarf (handed over to my sister in time for the cold snap), I have nothing on my needles (well nothing except the works in progress that live in bags around the house). 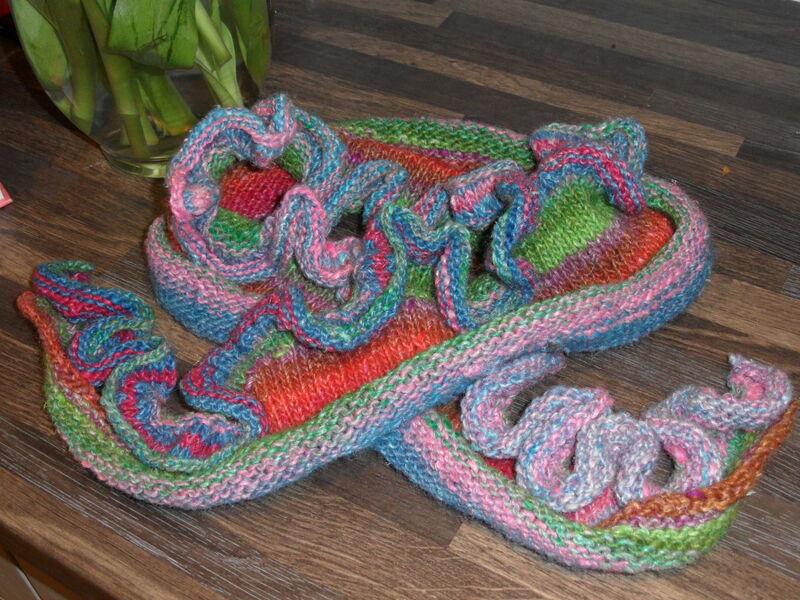 The official name for the wibbly wobbly scarf is Just Enough Ruffles and is available on Ravelry (caution – Ravelry will steal time from you if you like anything woolly). 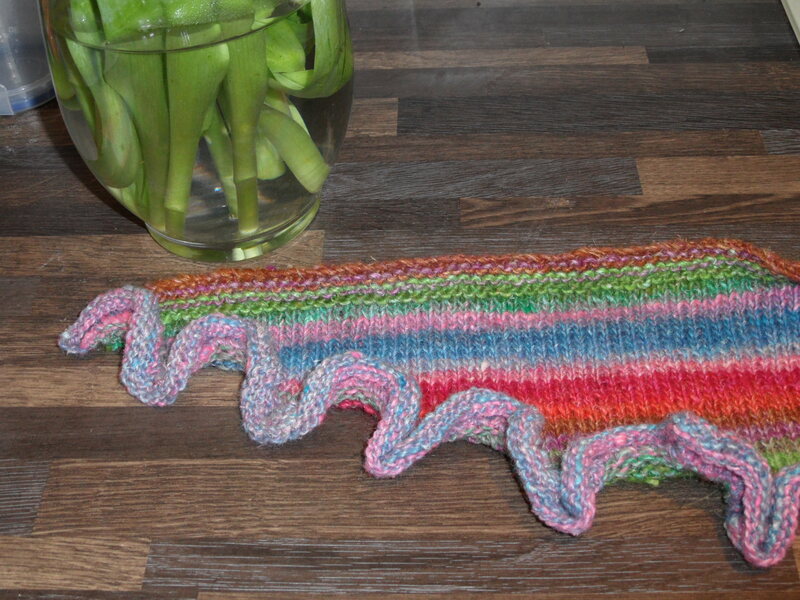 It’s my first attempt at knitting anything long on circular needles (I’m a proper convert to knitting on Knit-Pro needles) – I’ve knitted shorter things on them, but have always been intimidated by a pattern that starts “cast on 200…”.This scarf is knitted lengthways and starts with the words “cast on 200”. 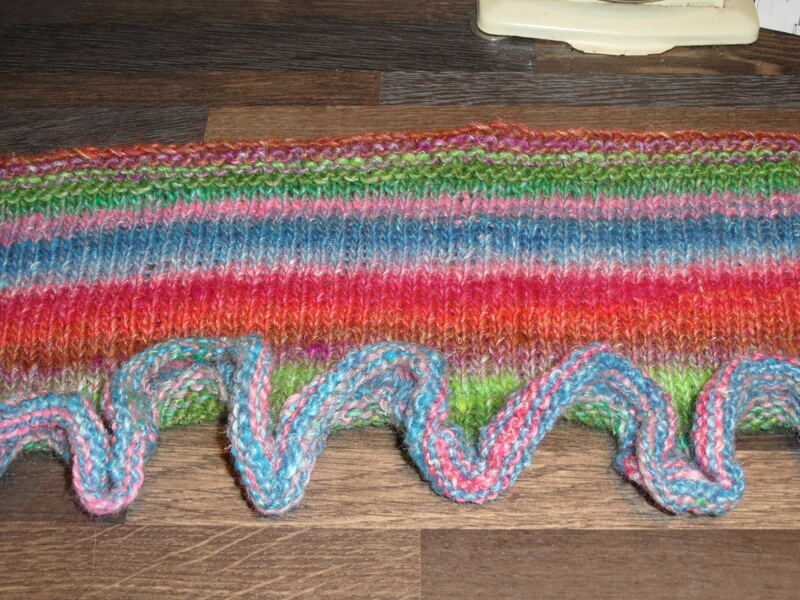 Before knitting front and back and in each stitch until you end up with SIX HUNDRED stitches on there. Phew. The next thing on the craft agenda is a bit of cross stitch courtesy of a competition prize courtest of SW Craft Club. Coo! Glad you made the meet up. It was nice seeing you again. Love your crafty post! What a lovely scarf you made. I am just thinking I may do a post now… either that, or take my Christmas tree down. Seriously! I too am still recovering from Janathon, apparently. Nice to have a change of pace — literally!